Ironically, since the sun-sugar and the black plum were returning favorites, I kept track of them by placing them in the same corner spots as in previous years. So, I can absolutely tell you what those two huge pots with the dead stuff in them are. If the system I was attempting to employ works out, then the unidentified plant with fruit should be either rosalita or wild cherry, because, according to the suppliers they mature the fastest. Since (as explained above) I think I know which plant is the wild cherry, that means the fruit you see here should be rosalita. Isis candy purportedly matures just a week behind them, while Dr. Carolyn should follow two weeks later. So, it’ll be fun to see if this schedule holds and more fun to be surprised when the fruit go from green to their true colors: rosalita is a red grape, Dr. Carolyn is an ivory cherry, wild cherry is a deep red, and isis candy is a yellow-orange cherry with red veins. Hello Avis, I have not planted tomato before. So can’t comment on your question. The portulaca seeds I sowed the other day did not follow the growth prediction. The seeds did germinate fast but only a few little plants are left in the container now. Most of them got fried. The few that are left grow really slow. Much slower that the prediction on the packet ;-( Btw, the pictures of ixora blooms I put up… it only took about 3 weeks from first to last photo 😉 Happy Monday! We’ll see how reliable the supplier packets are with the tomatoes. I wonder how they come up with those timetables, considering that there are so many variables like temperature, sunlight, etc., that could impact how fast something will flower. 1. I’ve never had a truly full-sun vegetable garden. I’ve still had pretty good luck, but harvests are later (and smaller) than in full sun gardens. 2. Our climate is cooler than other areas of the country. It seems logical that tomatoes (and other warm-season veggies,) mature faster in warmer climates. Possibly even in the same area, different microclimates in different gardens can make a difference in how quickly vegetables mature. Seed packets’ estimates just give one number without accounting for variables. I suspect this year about everyone’s tomatoes in the Chicago area have been or will be later than usual due to the unusually cool summer. So right. And you’re right about the cool Chicago summer, too. I usually have tomatoes by now. Congrats on becoming a dot.com-er. I’ll check it out and others can too by clicking on your comment link. At least you will be able to determine which are which when the fruit is produced. I never really follow the suppliers predictions for my tomatoes. They just get planted up and put in the greenhouse, and when they’re ready, they’re ready. Sounds like you’ve got some great varieties going. 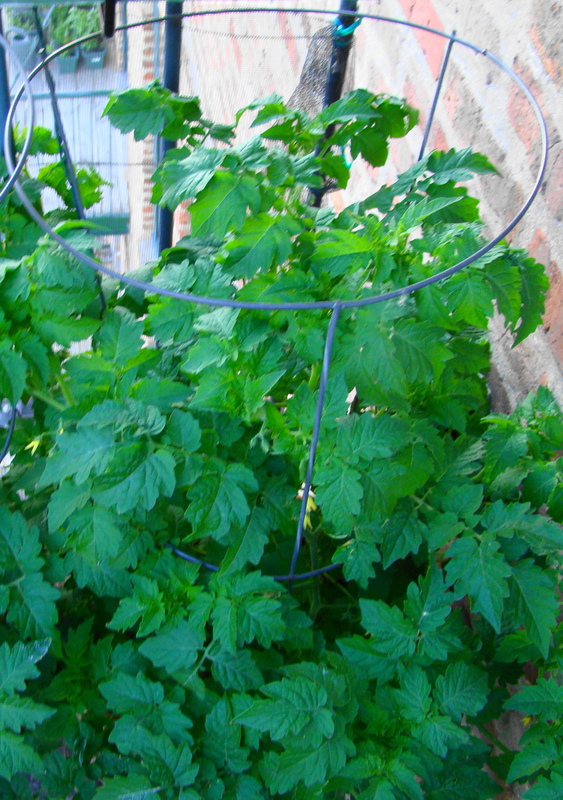 I just staked my tomato plants, too, that are in containers. I hope you get some good fruit sprouting soon. BTW, I changed my website and am now a dot com! Come visit me at http://www.gardeningwithmissdaisy.com. I started about five varieties of heirloom tomatoes back in late March. Two were cherries and three large slicers. All were bought from a local supplier, presumably good for the local climate. All sprouted quickly and made it to adulthood. All were delayed in going outside due to crazy weather. (Snow in June). NOT ONE has fruited yet. All have flowers, so I assume it should be soon? 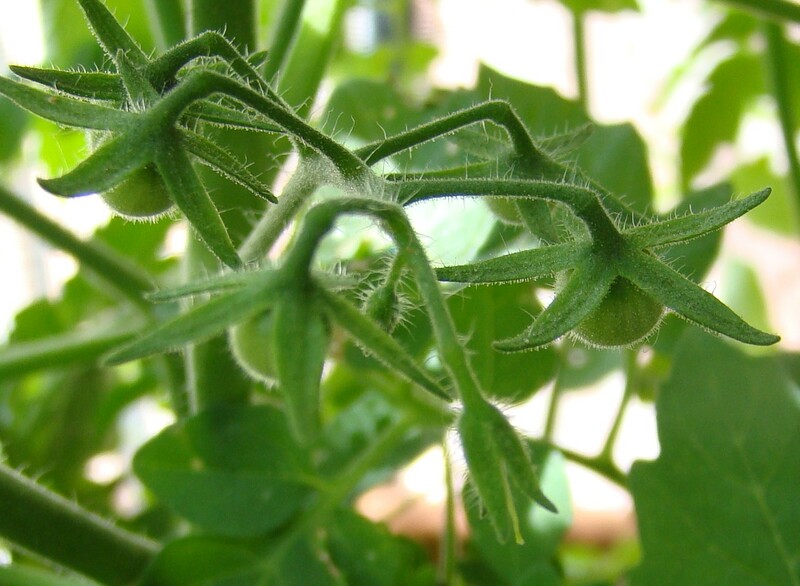 Since it’s been a very weird year weather wise, I have no idea what to expect – will I even see ripe tomatoes before fall? This is my first garden, and I have no idea how long they take from flower to fruit to ripe. The weather has delayed a lot of tomatoes this year, so I think lots of us are waiting with fingers crossed. I can say for sure, though that if you have flowers, you’ll see them replaced with tomatoes shortly. It’s extra exciting for you as a first-timer, eh? I’ll keep checking your blog for your first harvest. Cheers!